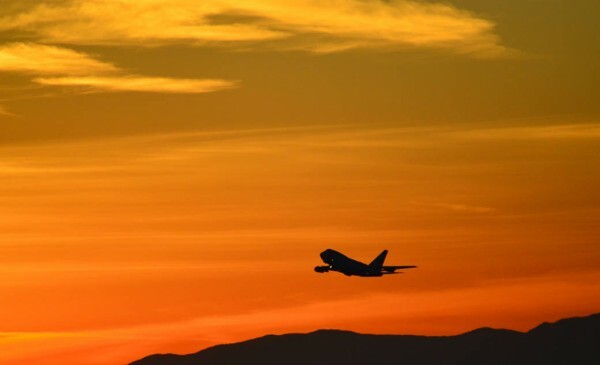 NASA’s Stratospheric Observatory for Infrared Astronomy (SOFIA) takes off from home base in Palmdale, California at sunset on May 29, 2015. SOFIA is the largest airborne observatory in the world, capable of making observations that are impossible for even the largest and highest ground-based telescopes. SOFIA is an 80/20 partnership of NASA and the German Aerospace Center (DLR), consisting of an extensively modified Boeing 747SP aircraft carrying a reflecting telescope with an effective diameter of 2.5 meters (100 inches). NASA and DLR have collaborated on a range of activities related to human spaceflight, space exploration, Earth science and astrophysics, and signed agreements on June 16, 2015 to work together to reduce aircraft noise and advance research into rotorcraft. This SOFIA mission was a science observation flight with the Faint Object infraRed CAmera for the SOFIA Telescope (FORCAST) science instrument, a mid-infrared camera that records images at infrared wavelengths of 5 to 40 microns that are used to study celestial objects such as planets and star forming regions. Teachers and educators joined the SOFIA crew on this flight, along with a Guest Investigator who was present for her awarded time on SOFIA. SOFIA is currently conducting science flights on a six week deployment in the Southern Hemisphere. SOFIA is based at NASA’s Armstrong Flight Research Center in Palmdale, California. NASA Ames Research Center in Moffett Field, California, manages SOFIA’s science and mission operations in cooperation with the Universities Space Research Association (USRA; Columbia, Md.) and the German SOFIA Institute (DSI; University of Stuttgart).